Everything in that jungle will kill you. And if it doesn't kill you it will f*** you up so bad you wish you were dead. 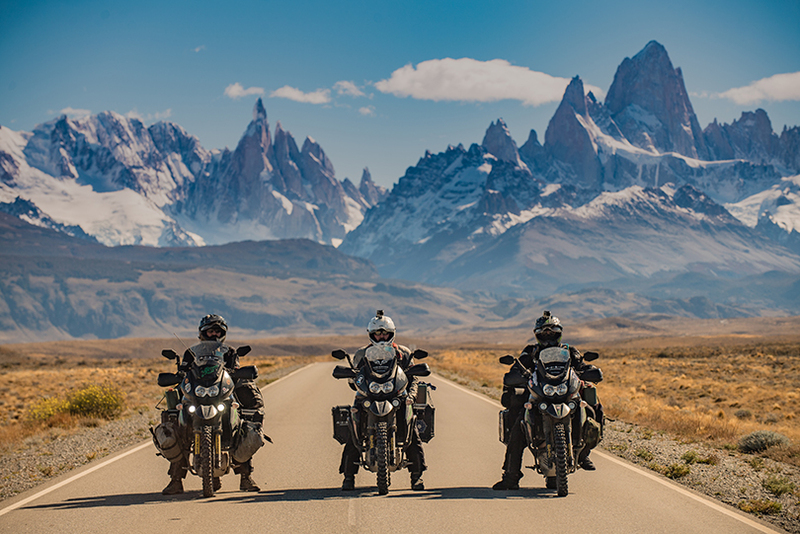 On April 1, 2018, three army vets on exhausted Kawasaki KLRs—and one incredibly grimy support van—rolled into Ushuaia Argentina, marking the end of the 18,571-mile journey from Dead Horse Alaska over 178 days. (The group started with four bikes, but we’ll get to that.) 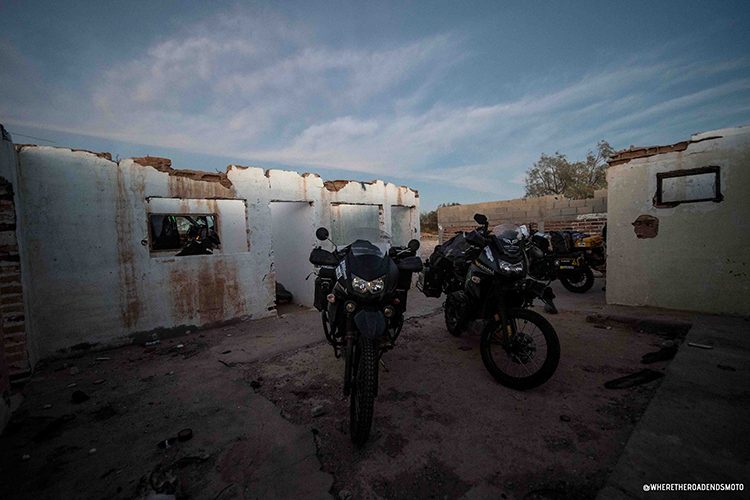 With the trip complete, we asked team rider Wayne Mitchell and videographer Jake Hamby to share some experiences from the first-ever motorcycle traverse of the Pan-American Highway. Not even joking when I say I used my Gerber Center-Drive every day to tighten bolts, open meals, tighten wires that held on my kickstand. Through the extreme landscape of mud and water, all four of the crews bikes broke. The first to break was left behind in the jungle. It was too far still to go to push and pull a broken bike. The remaining three trekked along for most of the jungle before succumbing to mechanical failure. With still quite a bit of the jungle to cover, the team pushed and pulled the bikes the remainder of the trip through the mud. 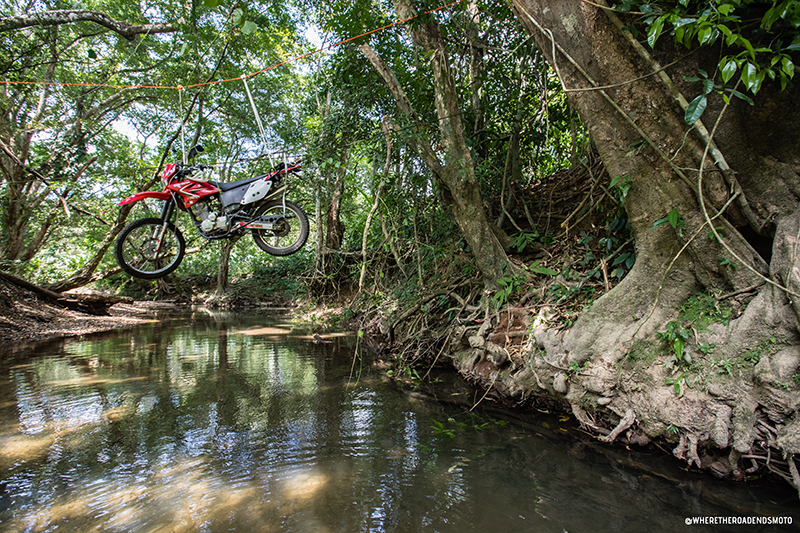 See how the crew deals with unruly amounts of mud as they trek through the Darien Gap. Hint: it takes a village. When we left the town of Cristales we all thought we were nearly home free. This was not the case! 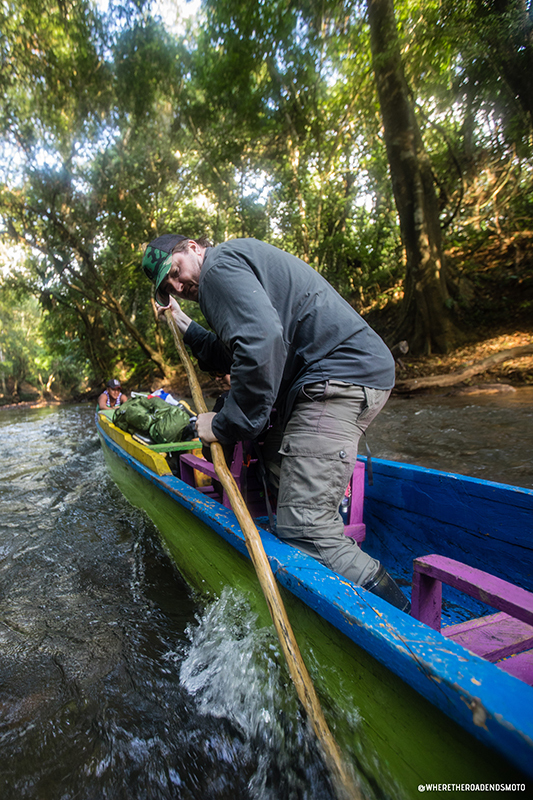 What we didn't realize is that the river route through the Atrato Swamp is a little shallow and we quickly found ourselves trying to move our heavily laden boats in only a few inches of water. As you can tell from everyone's faces, we were not in the mood. Eventually we ended up having to unload the bikes from the boats, roll them through the real shallow bits and drag the boats behind. The moral of the story? Don't take motorcycles in swamps. 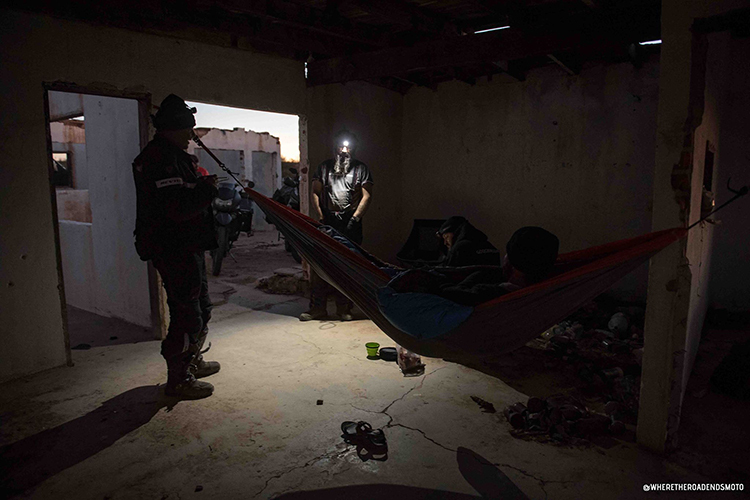 Nothing in the jungle comes easy, the least of which is a good night’s sleep. Day two of trying to cross the Darien Gap by motorcycle and the team is already tired. Stifling heat, high humidity, and exotic plants and animals make it difficult to find a comfortable place to rest for the night. Wayne breaks down how he stays off the ground and out of harm's way. Invaluable in the jungle. Each night we needed to clear an area big enough for our hammocks. The Darien Gap is dominated by mountainous rain forests on the Panamanian side and the Atrato River delta on the Colombian side. The full length of the Gap would be wet and cavernous. Both do not make ideal conditions to take a motorcycle through. Once we entered the the Darien Gap, we quickly realized how much wear the mud was putting on the clutches and engines. Knowing that this wasn't a quick day ride, we tackled every obstacle as methodically as possible to make sure we succeeded in making it through to Colombia. The video below is an example of the Trouble we tackled everyday in Darien. Sometimes with brute force. It’s difficult to imagine that an expedition stretching from the subzero tundra of the Arctic Circle to the sweltering deserts of South America, spanning some 19 thousand miles across 14 countries, could have a “dangerous part.” But for the Pan-American Highway, the Darién Gap is exactly that. A lawless expanse of swampy jungle occupying the borderland between Panama and Columbia. The highway evaporates leaving 100 miles of muddied rivers and tropical flora, before coming into clarity a hundred miles to the southeast. Constructing roads or bridges through this region would be a logistical nightmare: extremely costly, both economically and environmentally. So there are none. 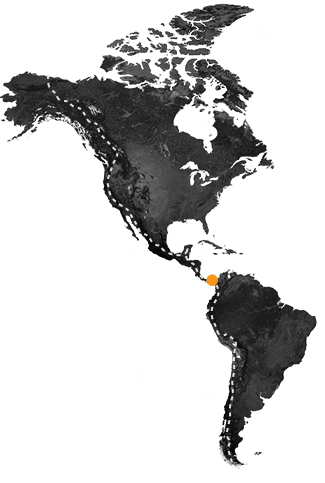 The geography on the Colombian side is dominated by the Atrato River delta, which creates a flatland of marsh and swamp fifty miles wide at its narrowest. The Panamanian side features a mountainous rainforest that rises and falls dramatically, from yawning ravines drawing cavernous swaths across the valley floor, to the soaring peak of six-thousand foot Cerro Tacarcuna. The region teems with peril. 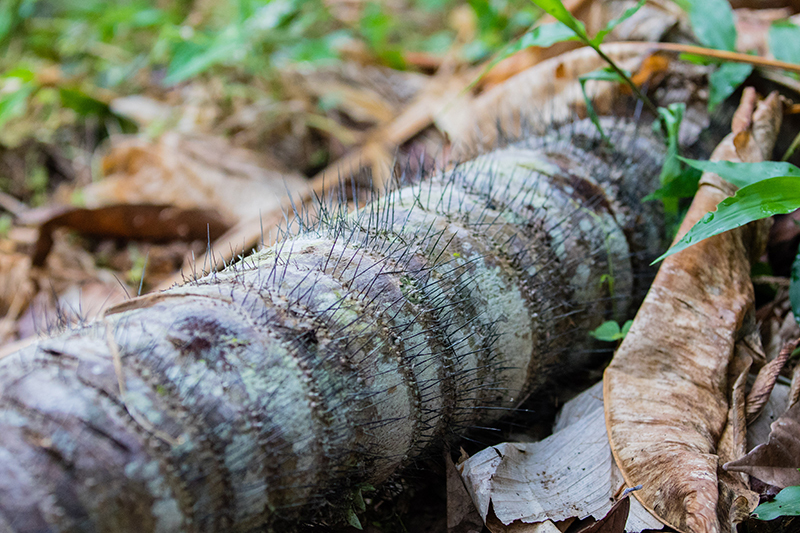 Exotic plants, snakes and insects. Stifling heat and humidity. And of course, drug smugglers, poachers, human traffickers, and antigovernment guerillas. Run a quick internet search of Darién Gap and you’ll find among the included terms “monsters,” “terrifying,” “missing tourist,” and “death.” The dangerous part. Which is exactly why the Where the Road Ends crew has spent the most time and energy planning for this stretch. It’s why they’ll be leaving Deadhorse, Alaska, amidst some of the coldest temperatures on the planet—so they can hit the Gap in the dry season, minimizing at least one threat from the roiling jungle: seasonal monsoons. 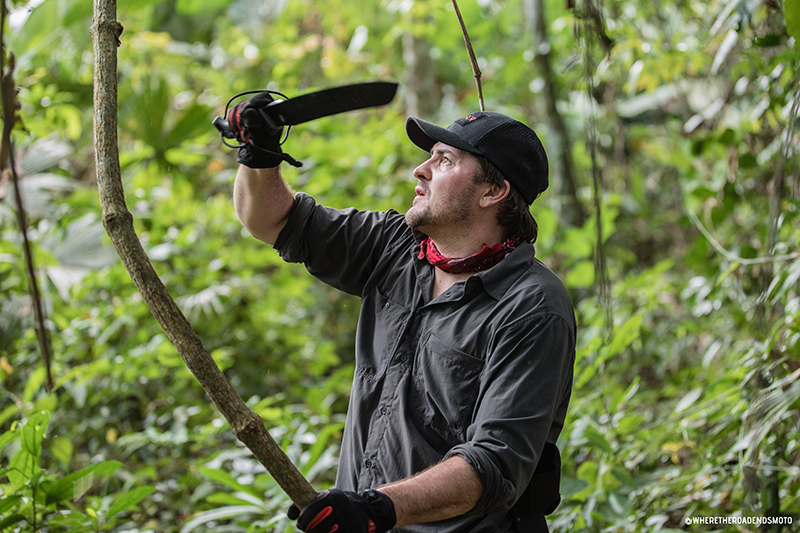 Where there is no path, the team will hack their way through vines and ferns and mangrove. Where there is no bridge, they’ll cross gullies and ravines using rudimentary rope-and-pulley systems—ferrying bikes and gear one gondola at a time. And even as they plan for every pitfall, and meticulously navigate the route, there’s still the issue of food. The team will thoughtfully pack what they can, and rely on plantains and rice to round out their diet, both of which are plentiful in the region. They want to err on the side of caution, but space is limited so they’ll have to be intentional, hoping for the best and planning for the worst. Because even with all the planning, packing, and precautions, there’s only one thing this crew knows for certain: there are no certainties in the Darién Gap. Lots of thorns out there. We are probably going to have to be removing them from people. 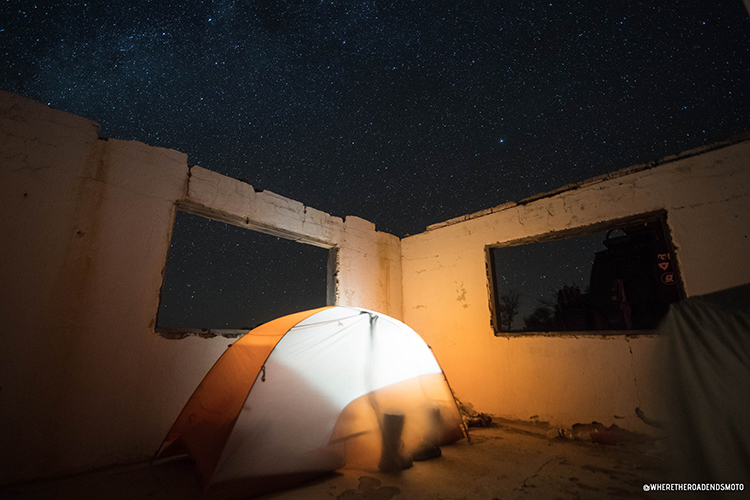 Any road trip can bring unpredictable camping locations, and this trip is no exception. 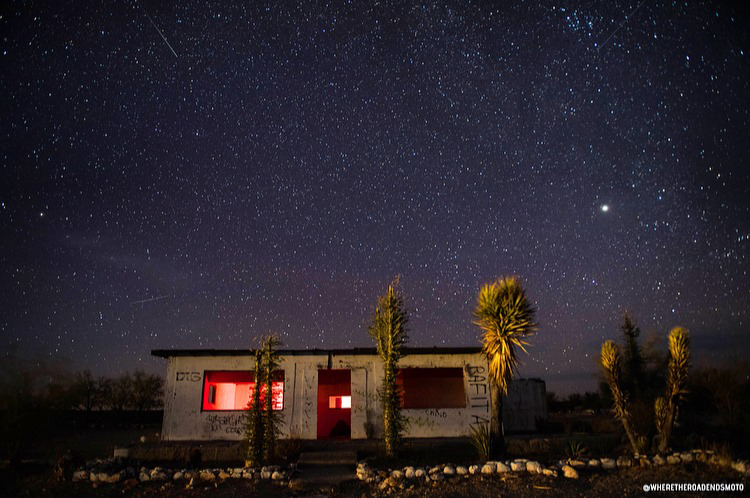 Where the Road Ends crew ended their night in an abandon building on the side of the road. These deluxe accommodations offer protection from the elements, separate cooking area, and ample room for the group to spread out. Check out Simon's video for the tour: Nothing beats a night under the stars. 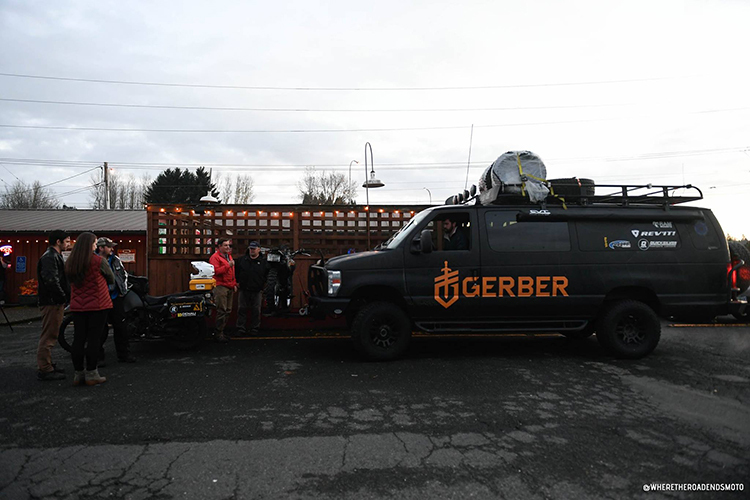 As the Where the Road Ends crew made it's way through the Pacific Northwest, they stopped by the Corner Saloon to meet with Gerber and the community. 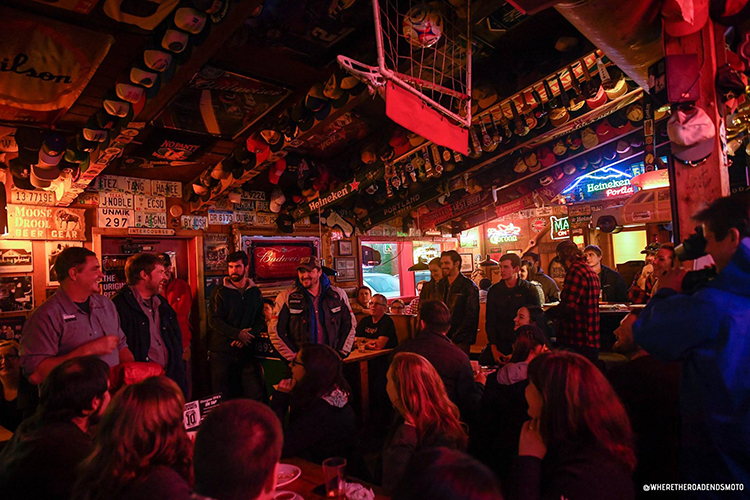 The crew shared some stories around a pint, showed off the alterations they have made to the bikes and Boar, and enjoyed time off the road. If you want to take motorcycles from Prudhoe Bay, Alaska down to Argentina through the Darien Gap, this is how you do it. With only days left, it's time to head up to Alaska. 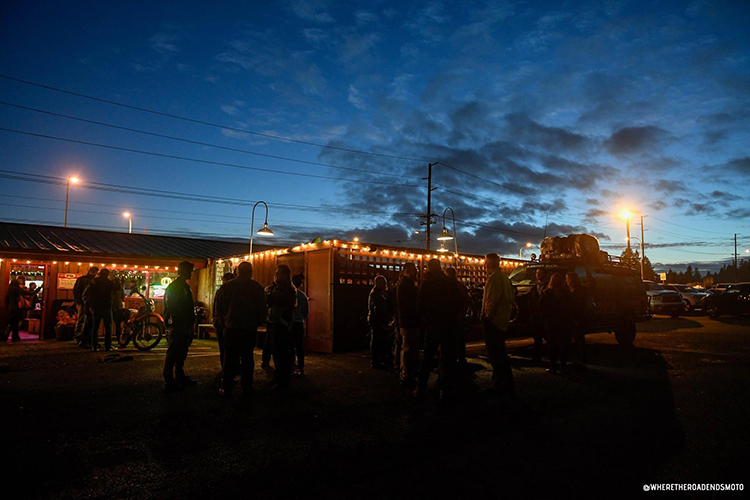 Louis, Alex, and Jake packed up the Black Boar and trailer and start their trek from Colorado to Anchorage. Four flat tires later, they make it to Anchorage, AK to meet up with the rest of their team for final preparation. I have heard of guys in the back country getting flats on their motorcycles and packing the tires full of grass. I don’t think this one will hold grass. Only 4-weeks left before the team embarks on their journey from Alaska to South America. After much planning and preparation, now is the time to finalize every detail. 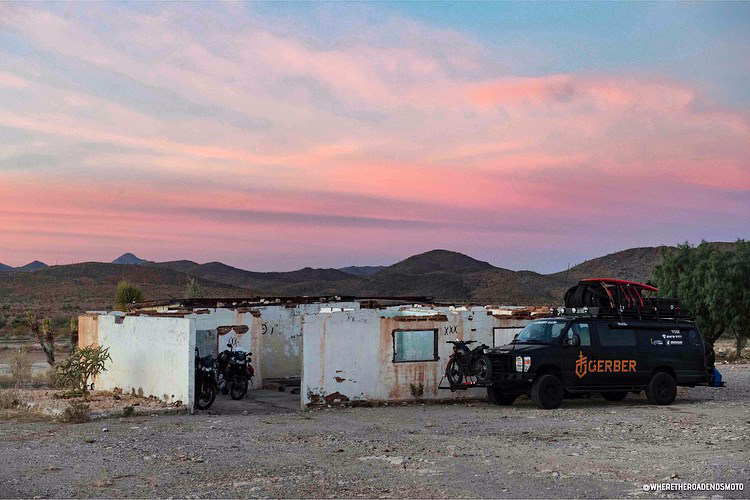 Where the Road Ends has started documenting their final days to show what it takes to complete an expedition of this size and caliber. With just 30 days left before the team starts their journey, they are focusing on all the final tasks. Packing and moving all equipment up to Alaska is a large endeavor. We have about 30 days before we head up to Alaska with the whole team. Today we've been packing a 24 ft. trailer full of Shiftpod tents, Dunlop Motorcycle Tires, and our Kawasaki USA KLR sidecar rigs, all of which Rich will haul up to Fairbanks, AK this week. The Bonneville Motorcycle Speed Trials is the premier motorcycle land speed racing event. Participants from all over the country come together every year to test their vehicles and shoot for a world Record. At this year’s Speed Trials, 52 AMA National Records & FIM World Records in 7 categories were set (pending ratification). Some came out to beat their personal best, while some competed for the first time. In the video below, Simon is getting ready to run his Kawasaki ZX14, which holds the 1650cc class record at 213 mph. Earlier in the week, he had some over-heating issues that limited the bike to about 150 miles per hour. Simon attempted to set a new record this year: KLR 650cc with a sidecar. At 72mph he thought he had it. Unfortunately, the record was dismissed after measuring the KLR’s displacement at 651cc and therefor out of the 650cc class. There is always next year.